Tag Archives: Koreans are living a fast-paced lifestyle. 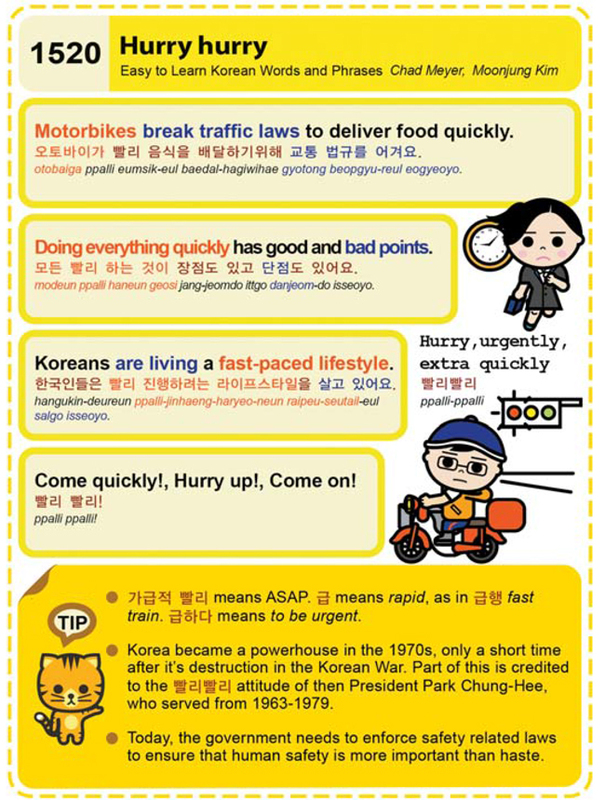 Easy to Learn Korean 1520 – Hurry, hurry. Posted in Series	| Tagged ASAP, Come on!, Come quickly, Doing everything quickly has good and bad points., extra quickly, fast fast, fast train, Food delivery motorbikes break traffic laws to deliver food quickly., government, Hurry, Hurry up!, Korean War, Koreans are living a fast-paced lifestyle., pall ppalli, President Park Chung-Hee, to be urgent, urgently, 가급적 빨리, 급, 급하다, 급행, 모든 빨리 하는 것이 장점도 있고 단점도 있어요., 빨리 빨리, 빨리빨리, 음식 배달 오토바이 빨리 음식을 배달하기 교통 법규를 어겨요., 한국인들은 빨리 진행하려는 라이프스타일을 살고 있어요.